"My father gave me some advice when I was very young - whatever someone tells you in the future, don't forget Pele is the best. I met him once. I am not often nervous but in this moment I was shaking. He's a wonderful person." "if we play our best in pre-season, I’ve done something completely wrong. It’s another session, it’s not about beating our opponents." "Sometimes it's better that you lose when you know why you lose than you win and you have no idea why you won,"
Klopp: "If somebody wants a player from us, they have to pay, because we only have good players. Go for it, but not as a present." Haha, the man is not only a great motivator of players he doesn't want, he's also a fantastic salesman! “I really want to look back after the season and be really satisfied. At this stage I don’t have any idea what that could mean. “It’s clear that winning every game would make me satisfied but if we did that I’d be too drunk to look back! "When we arrived at Mainz at 2am in the morning I thought ‘who had this idea?’ I could not blame somebody, I tried to blame the cat!" No wonder we lost 4-0! "In the highest level of football, the difference between a very good player and an outstanding player is making the decisions". @Dortmund fan, yes he did, first time I have heard him say it. "You can say 'But they have this, they have that' - it is useless. We will work with what we have." I'm not surprised he doesn't want to hear his name sung, that generic tuneless chant is awful IMO. "They [the players] are responsible for good performances. I am responsible for bad performances." “Confidence is like a small flower and in every game the other team tries to trample on it. That’s what we have to beware of." Apparently this is a man communicating in his second language. Lovely quote. Still no words of wisdom about our outstanding character. "We need to be angry against <insert next team here> because they want our points. That makes me angry!" Love that.. every game is a cup final! "I was very young and when I first made it I got a team," says the now 49-year-old German. "After one year a kind of sports director came to me. 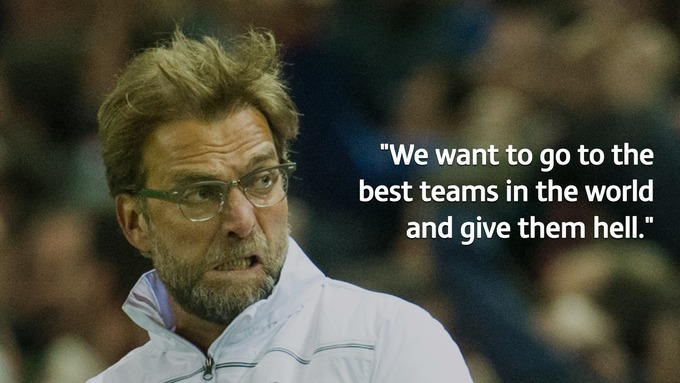 It's a reminder that, first and foremost, Klopp is a coach. There's even a guarantee. "Actually, I can promise that before we sign a player which is not a lot better than what we have, we'll always use our own boys," he says. "That's how it is. That's how the future should be. Even in this crazy football transfer world, we want to be this special club." "I prefer collecting points, then collecting a prize"
I know this is for quotes.. but watch this! Samuel L Jackson could not have made that look any cooler. "Apart from the table, it's a very important game. I know about the history, I like the special stories. The whole world will watch this game, it's a big honour to be part of it."